Your 5.0 cu. ft. GE Free-Standing Electric Self-Cleaning Range in Silver Metallic features a Digital Temperature display. Two 8 in. 2600 Watt burners (right front and left rear) let you cook large meals. The 4 burner upswept cooktop easily wipes clean. The chrome drip bowls contain spills and remove for easy cleaning. The coil heating elements produce even heat and easy cleanup, also. GE appliances provide up-to-date technology and exceptional quality to simplify the way you live. With a timeless appearance, this family of appliances is ideal for your family. And coming from one of the most trusted names in America, you know that this entire selection of appliances is as advanced as it is practical. You will need CAD Software such as DraftSight or AutoCAD to view these DWG documents. 5.0 cu. 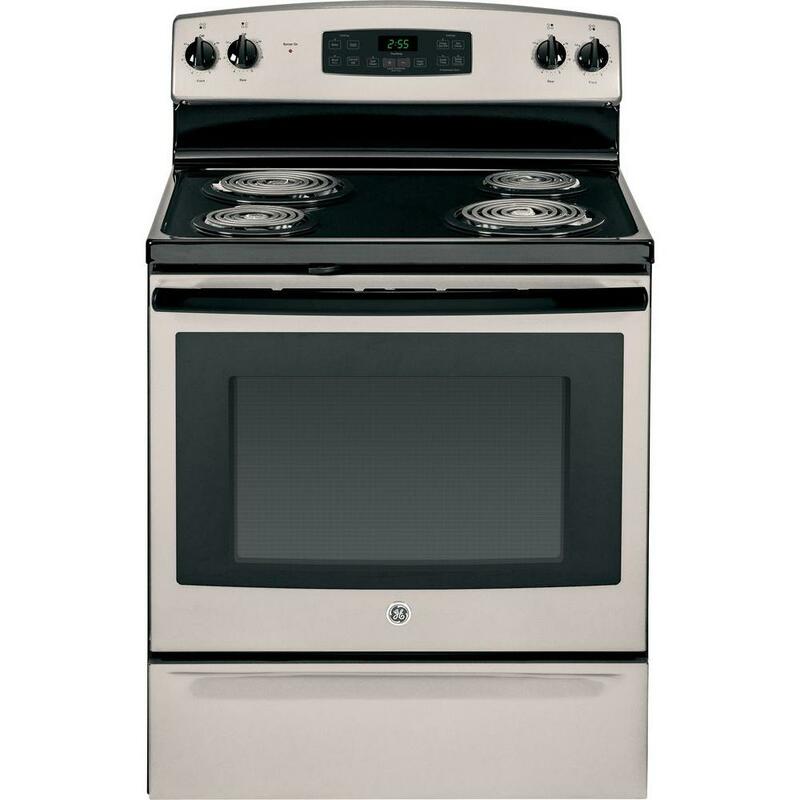 ft. Electric Range with Self-Cleaning Oven in Silver is rated 4.2 out of 5 by 349. Rated 1 out of 5 by Fritz from I am very disappointed with the GE electric range, which I recently ordered online. I would neve... 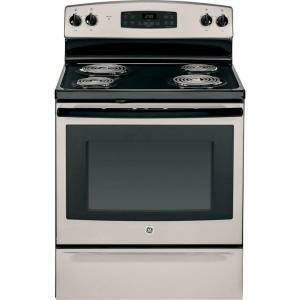 I am very disappointed with the GE electric range, which I recently ordered online. I would never have ordered it if I had seen it in person first. It is very cheaply made - the control panel looks like it doesn't quite fit right, and the screws that hold it on are clearly visible. The bottom utility drawer is narrow and flimsy. The interior of the oven is smaller than my old oven, even though the outside dimensions are the same. When the oven is turned on it makes all kinds of noises ranging from thumping, pinging, tapping and chirping. The higher the temperature the more noise it makes. This electric range is lightweight, cheaply made and is best described as a glorified tin can. I realize that "you get what you pay for" but I expected better quality than this. Needless to say, I am extremely disappointed, especially since I have bought many GE appliances in the past and have always been satisfied. It definitely did not meet my expectations. Rated 5 out of 5 by Dawn17 from Durable and Reliable I've had this range about a month and am loving it so far. I'd like to update my review in a few months to see if anything changes. I have a large family and many people use this range daily. My previous range was a smooth top and it was so hard to clean up and scratched easily. This one is durable and clean up is so fast and easy, it's also a beautiful design! It cooks evenly and heats up faster than my smooth top. This is my first GE appliance, and I'm very happy with my purchase. Rated 5 out of 5 by Coop from Modular parts,old school looks,high tech function,and self serviceable.No glass top... Modular parts,old school looks,high tech function,and self serviceable.No glass top to scratch up, cheep universal parts available everywhere.Engineered for people who like things that work for years with easy low tech maintenance. LOVE IT!